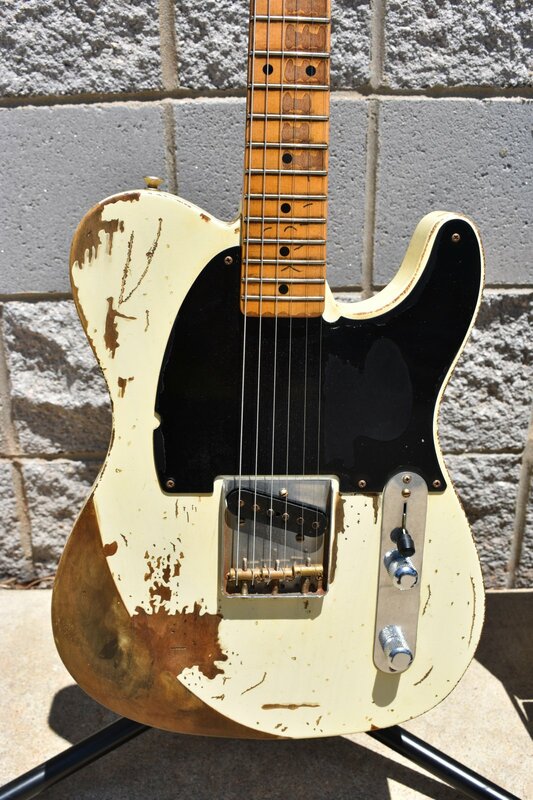 The Jeff Beck Esquire® Relic® is an exact reproduction of the Esquire used by Jeff Beck during his tenure with the Yardbirds, and is one of the most significant guitars in Rock & Roll history. The original guitar is currently owned by Seymour Duncan and is on loan to the Rock & Roll Hall of Fame. Position 2. Volume Control with Cap. and Tone Control with Cap. This exact reproduction duplicates the weight, neckshape, dings and wear patterns of the original guitar. COMMENTS: Limited run of 150 instruments in 2006. Seriel # JC382 is in BRAND NEW CONDITION! Unplayed and in storage since 2006. Comes with box with all paper work (including two certificates), CD's, poster and leather folder with DVD history of the guitar. OUR PRICE: $ 20,000.00 Includes FREE SHIPPING to U.S. Addresses. NO INTERNATIONAL SHIPPING.